I feed Sportsman Mix 26-18. My 40 lb Llewellin keeps his weight year around, and has plenty of energy and stamina. Stools are good. For a few years, I have fed "Sportzman's Mix" in the blue bag. It's priced at less than 60 cents a pound, is a 26-18 product, and works well for my Setter. It's a good feed that should be quite sufficient for most working dogs. For any pups I ever had, I never bought a puppy feed. As long as they can chew the kibble, use an all age quality feed. I also found that giving calcium supplements to pregnant humans was a good idea for fetal development and ease of delivery. I'm not a Vet so not sure of why the difference with dogs. I feed "Sportsman's Mix" (26-18 blue bag), and I pay slightly over $28 tax included for 50 pounds. Good energy, good stools, and good coat. Broad-spectrum digestive enzymes would be my first choice, and secondly changing feed. If the food is digested better, the flora will take care of itself, but adding yogurt would be a plus. Could be a blockage, at least a partial blockage in the gut. There could even be a necrotic area there. I'm not a Veterinarian, but it sounds like another Vet opinion might be in order. It could be a fungus and none of the meds would have helped that, or some plant in the yard. with a plant though, you should have seen a quicker response to the steroids and benedryl. Another consideration might be a chemical sensitivity from something in the house. Using a 26-18 Sportsman's Mix or something similar will cost less than 60 cents a pound, and will last nearly 50% longer than Ol'Roy Premium. Hence, more cost effective. Paying a dollar a pound or more for feed is likely only beneficial to the owner's mentality. Thyroid tests can be in the low normal range and the dog may need treatment. Like humans, the test ranges may be too wide. Very nice pictures SN! They don't get much better than that! 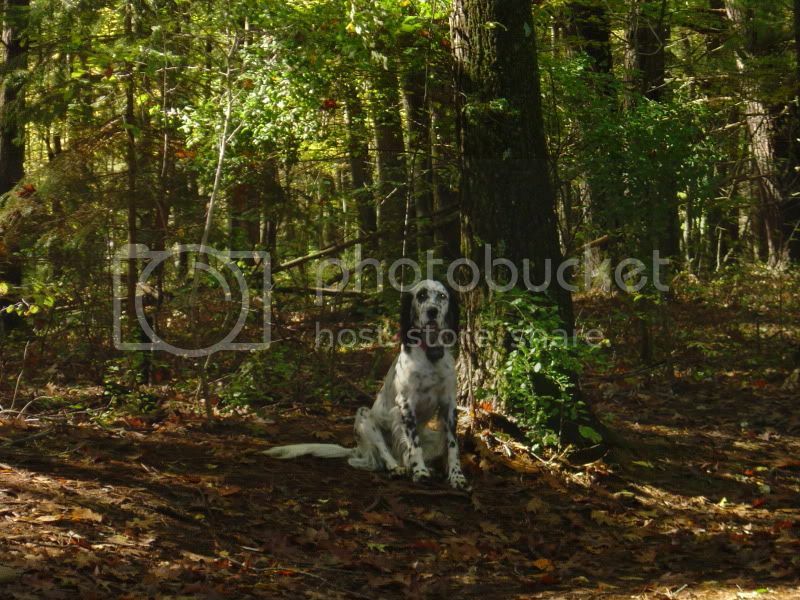 There's no other dog that match the beauty of a Setter. Since I have not been posting much, it appears threads like this "have gone to the dawgs!" Topic: Switching from puppy to adult feed? Re: Switching from puppy to adult feed? I would never use puppy feed in the first place. Therefore, the sooner the better as long as it's small kibble. Use a good quality adult or all age with say a 26-18 ratio or so with the first ingredient being a good meat or meat by-product. My feedstore was out of Loyall, so I picked up a bag of 26-18 Sportsmix. Dogs are doing fine, and as is usually true, most dogs do well on most good feeds. All of us old Veterans thank you, and we thank the Veterans who serve now or who have recently served. Dr. Dodd is generally correct I think. Keep in mind she is from California I think. Different parts of the country have different needs re vaccinations. I think she states that in articles I have read of hers a few years ago. The point is well taken that vaccinations may be done to excess frequently. Topic: What kind of food? Re: What kind of food? Check out Loyall. Also, most performance dogs do well on most good feeds. I would recommend Jim YerYar of Midland, Indiana. He's where I got my Llewellin. He actually hunts wild grouse with his dogs. He's honest and reasonable. Each to their own, but I wouldn't want to pay over .85 a lb for their best feed. I assume it may cost a wee bit more since it's imported from Ireland. I guess if you are Irish and have plenty of money, go for it. I'll stay with American feeds that are likely superior. Dog feeds have been discussed extensively here, and I would assume feeding a working beagle would be no different than feeding a working birddog. Therefore, what's the cost of the product and a list of the first five ingredients? That's a start for discussion. I haven't done any deep thinking about this, but maybe you just can't believe what some labels say. Other things are more important as we have often discussed. Certainly good quality ingredients in the right amounts are important. Topic: When to switch to adult food? Re: When to switch to adult food? Use a small kibble good adult feed that the puppy can handle. Start before the pup is weaned, and don't use a puppy feed. It doesn't have to be 30/20, 26/18 or so is fine. True. Loyall is made in the K.C. area at their main plant. I kinda feel sorry for the owners of "stub-tails" and "off-brands." Bet they are kinda envious about now. A good dog is a good dog, but SETTERS RULE! Yogurt or a probiotic is a good idea, but you might simply try cutting the volume of the feed 10-20%. As long as the kibble is small and the puppy can chew it well, there's no need for a puppy formula. A good adult formula is all you need because the puppy cannot read the label. It would have to be a city person to ask that dumb of a question! Either an E. Setter or a L. Setter would work well. It's hard to tell by their looks. My L. Setter is not the prettiest, but he's a birdfinder, has medium range, and is a natural retriever.